Michael Dubin started a company that sold a stripped down version of razors without fanciful features and shipped them to your door. He decided to scale it up to the world and by making a YouTube video that features him, the CEO, explaining his business model. The video was called “Our Blades Are F***ing Great”. It became an instant sensation, about 12,000 customers signed up within 48 hours that followed and 19 million views as of June 2015. This is most impressive, considering their existing audience and followers are next-to-none when they posted the video. [/vc_column_text][vc_video link=”https://www.youtube.com/watch?v=ZUG9qYTJMsI”][vc_column_text]This video was shot and uploaded in 2012 but have a quick look at the comment section, new comments are made complimenting their services every day. 3 years later, that video is still bringing in money. But wait … all these at what cost? Answer: $4500, to make that video which would otherwise cost $50,000. How did he do it? Dubin’s connections helped keep Dollar Shave Club’s Video production low. Commercial’s director, Aniello helm Paulilu, is a friend from his university days. Take a closer look at the video, do you see the razors they are selling? No, instead you see machete, falling bills and an oversized teddy bear. That is because they know their audience well; they are marketing to tech-savvy younger men, who are also the most open audience to make purchases online. Furthermore, they were clear of their selling points – price and delivery method. They stripped their products down to bare essentials and made a direct comparison with brand name razors with “shave tech you don’t need”. Sometimes, being all serious in business isn’t always good. Make connections early, someday it could prove helpful. Know your target audience well and unique selling point well. Most of all, take action by proactively reaching out to them. Pet Rock? How can a pet BE a rock? It must be a joke! Indeed, it’s an “absurd” joke that costs $3.95 each, turning Gary Dahl into a multi-millionaire. In 1975, Dahl was a 38 years-old ad copywriter based in Los Gatos, California. While some may say this product is absolutely useless, Dahl told People in 1975 that “You might say we’ve packaged a sense of humor.”. Sadly, humor has a short shelf-life, the craze was over by the end early months of 1976, but Dahl has already made his fortune. With a cost price of $1 each, he told New York Times in 2004 that “I put about $5 million of today’s money in my pocket,”. However, the journey was not all smooth sailing. In 1977, he was sued by two associates who helped financed his Pet Rock project after he quit his job, accusing him of not paying a fair share of the profit; Dahl lost the case and was ordered to pay a six-figure sum. In addition, he also failed to replicate the Pet Rock success when he tried to sell follow up items such as mail order college degrees for Pet Rock. Nevertheless, he managed to open a saloon and sailboat brokerage before returning to advertising, authoring the book Advertising for Dummies in 2001. 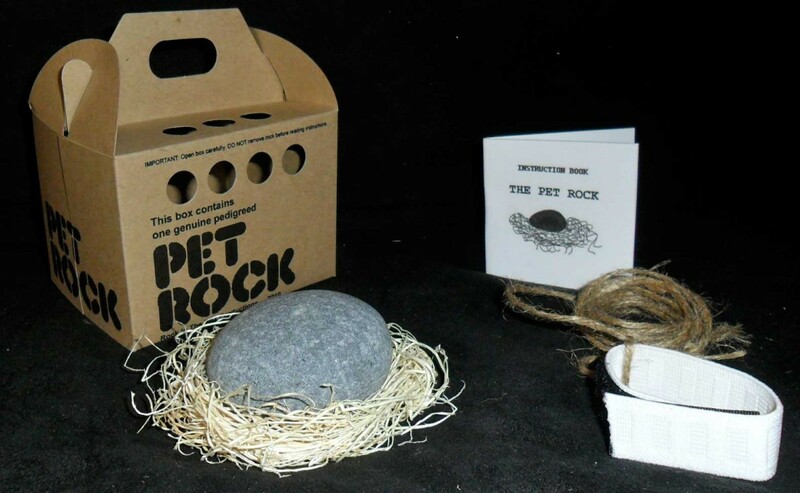 And now, Pet Rock is coming back at $9.95 each. Be open minded. Sometimes, the best idea comes from where you least expect it. Take action, start somewhere. Dahl started writing pet rock manual which was similar to his field of work. That’s where it really begun. If you think selling a rock is absurd, here comes something brutal – selling a star that you don’t own. At International Star Registry, you can get a personalised framed star chart including a complimentary personalised wallet card imprinted with star name and coordinates; all for just $489. If your budget is tight, you can get a basic set for yourself starting from $54 or send as a gift from $65. Compare these prices with Pet Rock, it is not difficult to guess which is more profitable. This is not a scam, they market their products and services as gift or memorials right from the beginning. There are buyers out there willing to purchase them as a gift. Scanning through the web, my favourite line is “Star Registry® offers a unique birthday gift, especially for the person that has everything. Your gift will shine in the sky and be light on each and every birthday for your loved one. Name a star for that special someone today.”. They must have understood their audiences mindset very well to be able to craft such compelling page! On a more serious note, you can start a company, build a website, start receiving orders and send out your own certificate. (Some shameless advertising, we can help you with these and other digital marketing services, check out the rest of our pages!) Anyone can start a star naming company because the names are unofficial anyway. Hence, with a large number separate business owners, the total profit remains relatively unknown. READ Science Threatened The Cigarette Industry. But What Marlboro Did Next Blew Everyone Away. Keep your eyes peeled. There are businesses that sell products that cost next to nothing. In fact, there are businesses which people pay and give you the raw materials you need to sell. E.g. Pallet recycling. Marketing is crucial if your product or services are easily copied. [/vc_column_text][vc_video link=”https://www.youtube.com/watch?v=IJNR2EpS0jw”][vc_column_text]You’ve probably seen this commercial before. This is one of the most innovative public safety videos of all time, dumb ways to die was a hit around the world and won numerous awards worldwide. As of August 2015, the video received over 110 million views. The aim of the campaign is to engage an audience that doesn’t really want to hear any kind of safety messages. Indeed, cute animations and catchy songs masked grotesque ways you could die, that would normally be censored, into a darkly cute and irksomely catchy ad that captures attention beyond their target audience. What about results? According to Metro trains, the campaign contributed to a more than 30% reduction in “near-miss”, from 13.29 near-misses per million kilometres in November 2011 – January 2012, to 9.17 near-misses per million kilometres in November 2012- January 2013. (Source) However, the campaign received some criticism that it reinforces deadly train as a suicide method. For the rest of us, let’s just enjoy an entertaining video and remember stay safe wherever you are. P.S: We do not receive any advertising profits from the above-mentioned companies. Hey, totally appreciate your great works so far. Clear examples with practical learning points. Hi! The web host that we use is newmediaexpress, LX2 package. As our domain ends with .com.sg, it is required by local regulation that their server must be based in Singapore for better security. Most web hosts have roughly the same price of about 120 USD. In our opinion, what is important is their customer service. As for speed, web host is but one of many factors how fast your web loads. As this is one of our field of specialisation, we like to take this opportunity to give some simple suggestions of what you could do for your web based on our experience. First, enable Gzip, it can cut down your page size by more than half. Second, optimise your image, choose “save for web” in photoshop or compress it using this online tool https://compressor.io . Third, minify using W3 total cache (you could enable gzip using this too). With these simple step, it should reduce your loading time and cut down your monthly bandwidth usage hence reducing your web hosting fees. Cheers! I simply could not go away your web site prior to suggesting that I really loved the standard info an individual provide on your visitors? Hi Alton! The only tip we can offer is that you need to offer good content. We were listed on Yahoo News 2 weeks ago with our first article. 5 pricing tactic you always fall for It went viral with more than 100,000 views in a week, globally. If this article is also on Yahoo News, we can only infer that they might start tracking you if you get listed once! We hope this is informative to you, wish you all the best! I got this web page from my pal who told me regarding this website and now this time I am visiting this web page and reading very informative content at this place. credit and sources back to your weblog? My blog site is in the very same area of interest as yours and my users would truly benefit from a lot of the information you present here. Hi Jerri, please go ahead! This type of clever work and reporting! Keep up the good works guys I’ve included you guys to my blogroll.